When I turned off the highway and began to follow the navigation closer to the destination I started to consider that Google had gotten it wrong. It wasn’t until I saw the bright sign reading “BREWERY” that I determined I was in the right spot. They are in an industrial area of Edina. One of those places where you occasionally find yourself driving by nondescript buildings with a variety of businesses you’ve never heard of and will instantly forget. 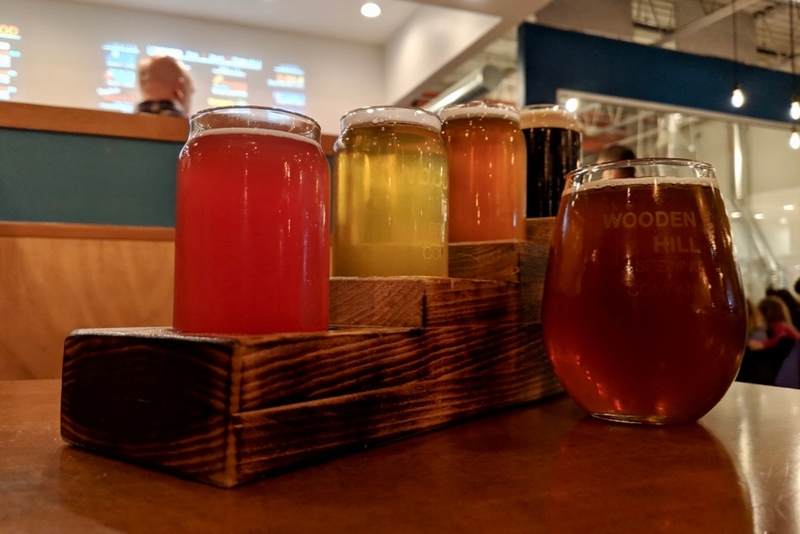 There are few taprooms that transform their interior quite like Wooden Hill. A bold orange and a bright turquoise color dominate the room. The ceiling is clean and exposed. 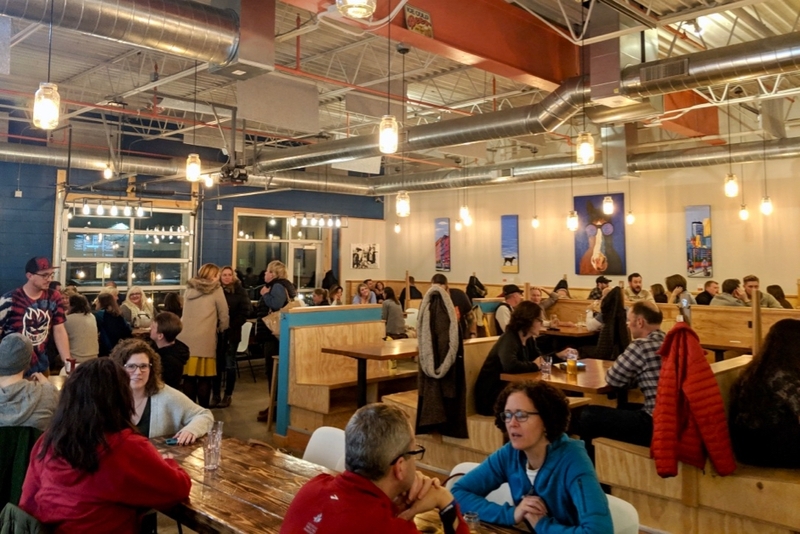 Wooden community tables are near the glass garage doors at the front of the taproom, and a series of wooden booths make up most of the rest of the seating. There are also booths that open on both end which for some unknown reason I really enjoy but that I’m never available to experience. Maybe it’s the thrill of the unknown! 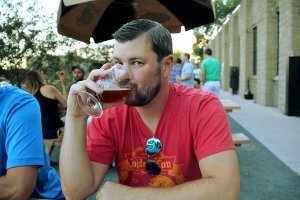 We were meeting two of our friends that live in Edina at the taproom, but we’d arrived a little early. We had our infant with us so we sat down at a booth, jammed the diaper bag in the corner, and set the carseat on top of the table. There was just enough room for the four (five) of us to sit. While my wife got situated I approached the bar to see what they had available. 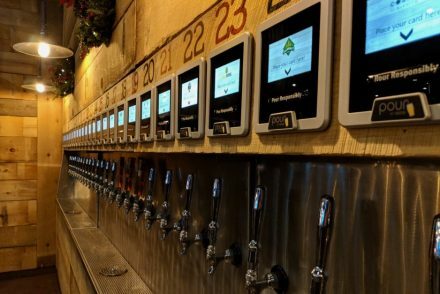 There were ten beers on tap, a lot of non-alcoholic options, and six different beer cocktails! 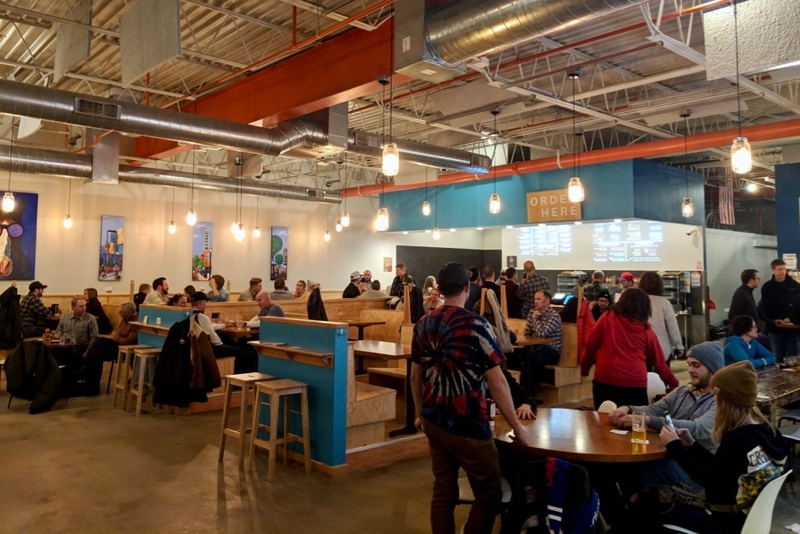 When I visit craft breweries I am not really looking for anything other than beer but I’m always happy to see different options for people that may not enjoy fermented cereal grains as much as I do. They’ve also got a menu of burgers, dogs, fries, and snacks that are made in a kitchen tucked into a corner of the room. We didn’t order any food during our visit but I have on subsequent visits and I can report that the food is quite good. The burgers and dogs are great and the fries are wonderfully, well, fried. 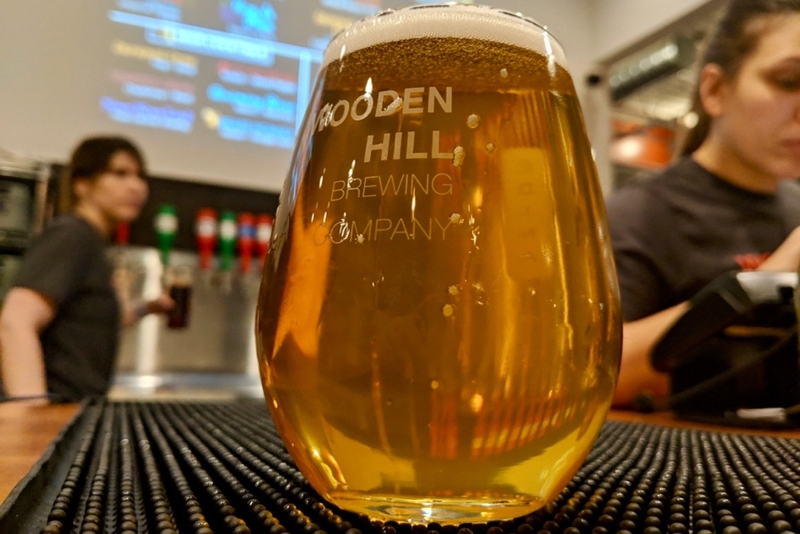 The tap list is projected onto the wall behind the bar and it’s separated into Light, Fruity, Hoppy, and Malty. 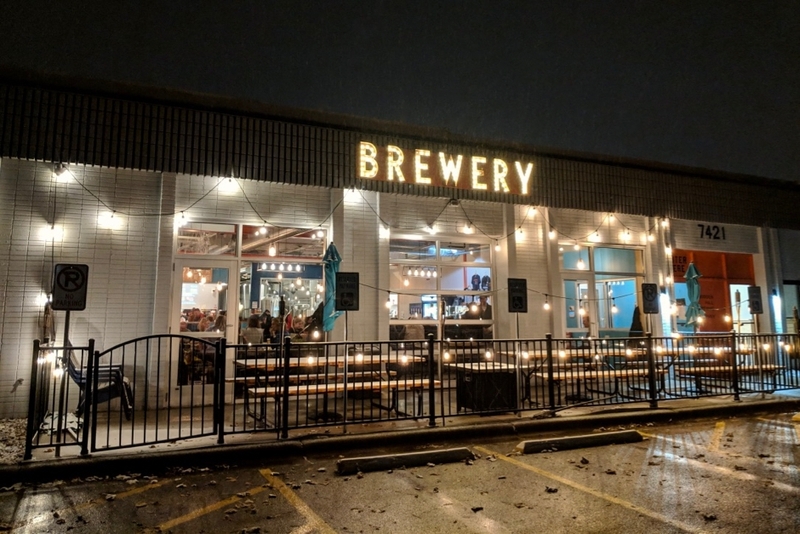 For the first brewery in a city that hasn’t had many close options it is a nice introduction to different styles of beer that still allows for a degree of exploration. 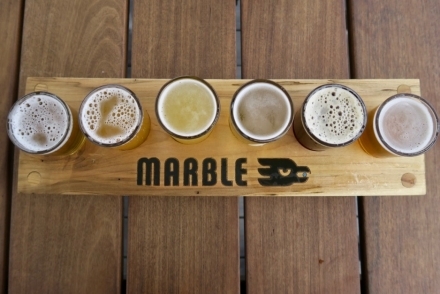 I ordered a flight of four and it arrived on a block of wood with each beer on a different step. The owners had a grandfather that used to call stairs “the wooden hill” so this style of flight board is a unique and creative nod to their origin story. It’s certainly like none I’ve seen before! The four beers in my flight were Pixie Catcher Cran-Raspberry Sour, Code 3 IPA, Caramel Frap Coffee Cream Ale, and Chocolate Crow Wheat Stout. I followed that with small glasses of their Double Macro Imperial Pilsener and BLDG: 6 Pale Ale. The standouts were the Pixie Catcher and BLDG: 6. If you would tell me that Pixie Catcher was fruit punch I would have no reason to doubt you. The color reminded me of Tahitian Treat! A mild sour taste, great raspberry and cranberry flavors, and a creaminess to balance the big flavors. BLDG: 6 was a delightfully juicy pale ale with a nice balanced bitterness and notes of mango and honeydew. Easily the favorite beer during all of my visits. We’ve been back to Wooden Hill several times since our initial visit so there are a couple of other details that I’ve got to comment on. Parking is an issue unless you know that there is a large lot behind the building. 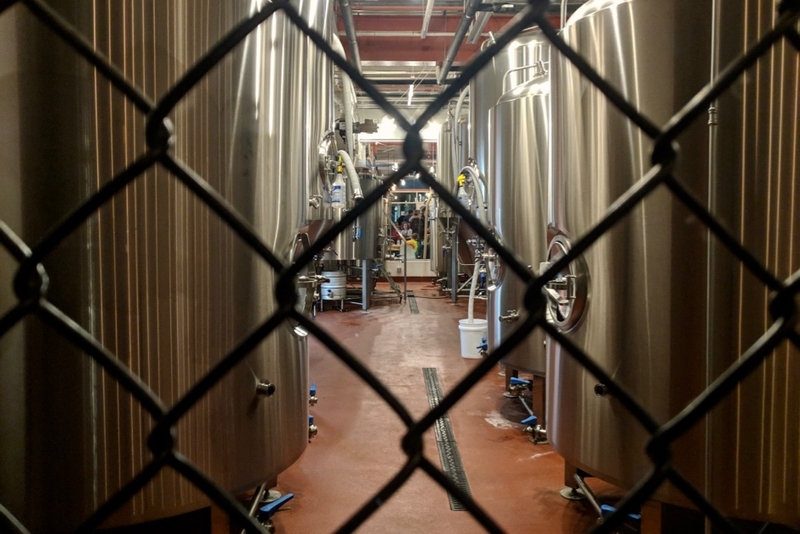 Don’t worry about walking because there is a rear entrance that opens into a secondary seating area situated behind the fenced fermenters. If it seems like there is no place to sit check a small door near the bathrooms which opens into overflow seating that may also function as an event space. 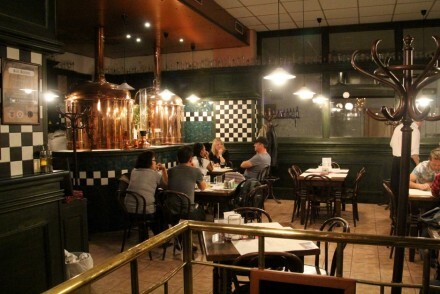 They are an extremely family friendly brewery and we’ve yet to visit without seeing children dotting the tables. There is also a small patio that I’ve yet to visit due to weather although it looks quite charming. Our daughter slept for the entire three hours of our visit. It was a lovely evening catching up with our friends and it’s become a common spot for us. The beer is decent and the food is tasty. We always feel welcome and it’s an excellent spot for young families. 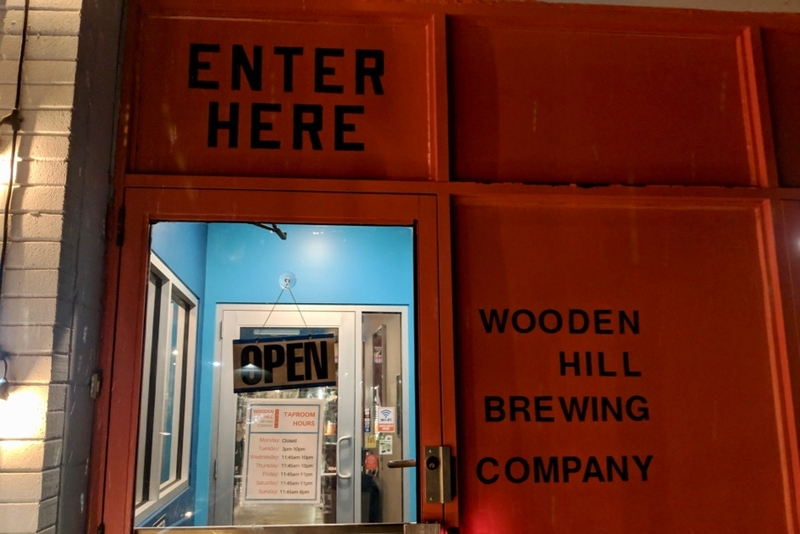 Until Bloomington gets its act together and allows craft breweries I’ll be returning to Edina frequently to visit Wooden Hill.